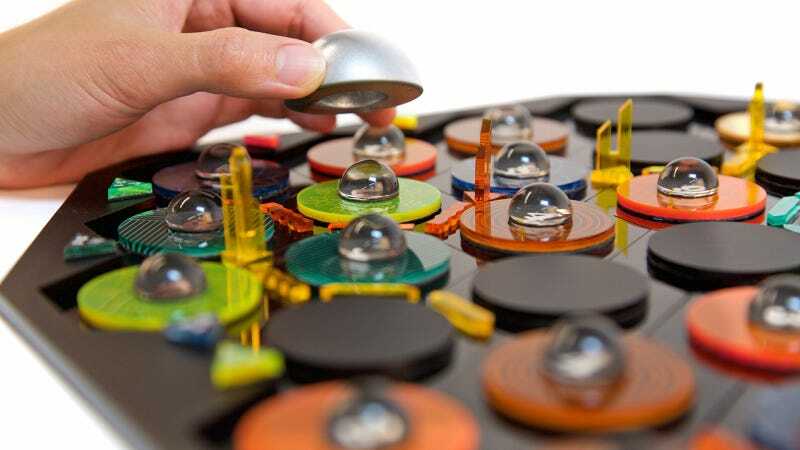 If you’re tired of your Settlers of Catan hexagonal tiles sliding all over the place, that’s just one of countless improvements that artists Amy Wang and Fuzzy Wobble made when they created Deep Space Settlers, a new, and much improved, version of the beloved board game. Let’s get the bad news out of the way first. You can’t buy Deep Space Settlers, so don’t bother putting it on your Christmas list. There’s already a Star Trek-themed version of the original game that covers similar ground, but we’re hoping that Mayfair games sees the brilliance in this redesign. Deep Space Settlers extends the gameplay ideas introduced in the Seafarers expansion of the original game, where exploring other unrevealed parts of the game board are integral to expanding your miniature empire. But otherwise gameplay is essentially the same, even requiring players to collect the same resources now called space wood, space sheep, space ore, space wheat, and space brick. Cute. Other improvements made to Deep Space Settlers, aside from a wonderful science fiction-inspired aesthetic, is the use of city playing pieces that expand vertically as they grow over time (instead of having to swap them out mid-game), an imposing robber that now completely envelopes a resource it’s targeting, and a board with raised edges that always stays assembled no matter how raucous your fellow players get.